We only spent 3 nights (a half day, two full days, and a half day,) in Paris, France, but we had a great time while we were there! I should preface this all by saying that you could spend weeks in Paris and not see everything, but we covered all of the major landmarks in 2.5 days, easy. Our train from the south of France got in around 2 pm, we got a taxi and went and checked into our amazing hotel. Now, I was a little worried about our hotel. I'm no 5-star visitor, but I am a hotel snob. A mid-range hotel snob, I suppose. I expect clean rooms, with AC, and friendly service. And I want the grout in my bathroom to be unstained, is that too much to ask? I knew we really would only be sleeping in our hotel, but I still wanted some place that was relaxing and clean. Our hotel, the Mercure near the Eiffel tower, was wonderful. The staff checked us in early, helped point us in the right direction, and helped us set up a shuttle to the airport at the end or our stay. Though we couldn't see the entire Eiffel tower, we saw about 2/3 of it from our window, and at night it lights up and is just breathtaking! Another plus for where we stayed was that it wasn't right in the heart of tourist land, so we got to see a bit of real life in Paris and our restaurant options were a notch lower in price than the ones closer to tourist spots. Our first day there we saw the Eiffel Tower and went up to the top. By the time we did that (and read all of the interesting signs about the tower,) we were beat and headed back home. We stopped at a little grocery store and stocked up on bottled water, sandwich meat and cheese, bread, and a few snack items. I would really recommend you do something like this if you ever travel to a big city. We saved close to 100-200 dollars just by being able to not buy a few snacks, water, and a lunch or two! Plus we didn't have to track down suitable food when that hunger struck! Ian dropped Grace off at the hotel to get changed (we were soaked in sweat since it was so hot!) and he went and picked up pizza....with HAM!! Please understand, ham, bacon, or any other form of pork product was a high priority on our food list. Ian brought back our pizzas and our first night ended watching TV in bed (a luxury!) and watching the sparkling Eiffel tower out our window. The second day we had passes for L'Open Tour's hop-on, hop-off, so we headed to our pick up point and went straight to Notre Dame Cathedral. We walked around, toured the inside, and had lunch sitting in the shade by the Seine River. We took our bus to the Musee D'Orsay to see the Impressionist paintings and also fell in love with their Orientalism section. Ian gashed his toe on a protruding pipe on the sidewalk outside but we carried on, going to see the Champs Elysee and getting to see the Arc de Triomphe. Having Grace with us got us a lot of "go directly to Go" passes- meaning we got to skip lines and take elevators instead of stairs! Grace had a major blow out diaper and I changed her on a bench on the Champs Elysee, amidst tons of tourists and shoppers. I know, I'm a classy person. Our last stop of the day was to Les Invalides, a hospital for war veterans that also houses the country's military museums and is where Napoleon Bonaparte is entombed. We got there just one hour before it closed so we were rushed and did not get to see much of the museum part, but what we did see was really interesting. We walked back to our hotel and got dinner at an Italian restaurant nearby. The next day we took the bus to the Louvre, bright and early. It is definitely important to get there early so that you don't have to wait in the long lines and so that you can get a head start on seeing this MASSIVE museum! We were there for most of the day and probably only laid eyes on 1/4 of everything. Their maps show the "most important," things though so we got to see the Mona Lisa, the Venus de Milo, the Code of Hammurabi, the Winged Victory of Samothrace, and a few more. My favorite things though, were in the exhibits from Babylon and Mesopotamia, pieces of historical evidence that corroborates the Bible! We had to take several breaks in the museum cafeteria, in order to feed Grace and rest our legs, but we had packed a snack so we only had to buy food once. We left the Louvre and headed to Notre Dame Cathedral, because we had read about a classical concert that was being held that night and because we wanted to go to the top of the Cathedral, which had been closed on Sunday for mass. Unfortunately, by the time we got there the tours were over and then we found out the concert would cost us a pretty penny. So we decided not to do it and went and had dinner at a cafe, ice cream from a famous place I had read about (it really wasn't any good,) and took the bus back to the tower. We waited around to see the lighting of the tower and then hurried back to our hotel in the rain. Our final morning there, we packed up, left our suitcases behind the front desk, and went for a stroll through the Parisian neighborhood. We ended up back by the Eiffel Tower and bought a few postcards and a key ring to use as an ornament. We ate lunch at the Italian restaurant again and then went back to the hotel to wait for our airport shuttle. Our whole trip felt like two different vacation: the first part was lazy and relaxed with close friends and lots of laughter while the second part was quick paced and full of new things to see as a family! If you are ever going to Paris and need some travel tips, let me know and I can send my "research," your way! Paris with kids is fun. . . we found it very family friendly. (Though, we didn't have any infants -- the boys were 2, 4, 5 and 6.) Everyone was so friendly and helpful. 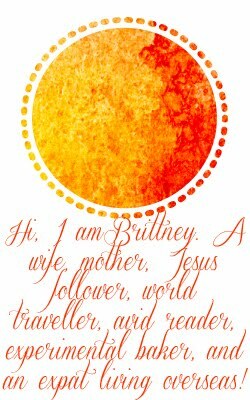 It sounds like such a fun trip, Brittney! And I've loved seeing all your pictures! My 18 yr old daughter and I plan to go to France this summer. Any recommendations would be great. My email is cathryn.pepin@gmail.com.